There are 10 species of squirrel in Texas. However only 3 are found in the North Texas area: Fox Squirrel, Southern Flying Squirrel, and Thirteen-Lined Ground Squirrel. 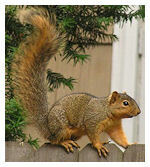 The Fox Squirrel has a large bushy tail and weighs 1-3 pounds. They also have a gray and reddish color tone. The Southern Flying Squirrel is a grayish brown with an ivory color underneath. Unlike most squirrels bushy tails the southern flying squirrel has a flat one. They have a patagium “furry membrane” with extends between the front and rear legs used to glide through the air. The 13-lined Squirrel is a brownish ground squirrel with 13 stripes that alter between brown and white on the backside. Naturally, squirrels prefer wooded areas with lots of trees where food is plenteous. Squirrels will nest in tree cavities, or if needed make a nest out of leaves, twigs, bark or sometimes corn husks. Squirrels prefer to live in human territory. They will burrow under sheds, homes, businesses, porches, decks, crawlspaces and woodpiles and create a dwelling. They will enter foundation openings to access these spots or make a squirrel hole in the foundation themselves. Squirrels can fit into chimneys, roofing vents to have their young. Attics, chimneys and crawlspaces are key locations in your home where squirrels seek shelter. Squirrel trapping and squirrel removal become necessary when they are determined to get inside your attic or home. Squirrels will usually nest in trees, using them for food and protection from predators. However, often times they will take up residence in a building if access to sheltered areas such as eaves and attic crawl spaces are available. If you hear loud gnawing, scratching, and pattering sounds, in early morning or mid day that is a key sign they are in your home. Wads of torn insulation, cardboard, and dried leaves and twigs may pinpoint nests, but nests and young may be totally concealed within eaves or wall spaces. When they have access to your eaves or attics they can damage insulation and electrical wiring. Squirrel trapping should be considered. Digging in lawns, eating ornamental plants and bulbs, and stealing food from bird feeders are also common behaviors of squirrels. Squirrels are main carriers of tick fever, powassan virus and rabies. Tick fever is a virus that results in: fever, headache, chills, eye pain, muscle pain, nausea and vomiting. Tick fever can be a severe illness, primarily children and the elderly.Powassan virus can cause severe encephalitis in humans and has an up to 60% fatality rate. Some signs of infection are sleepiness, disorientation and become semi comatose. Squirrels also carry fleas and ticks. If you have squirrels in the attic, you should contact Metro Guard for a free estimate and analysis. Squirrels are known to do a lot of damage to your home at a rapid rate. Our squirrel trapping program is highly successful. We offer humane solutions to squirrel control and squirrel removal.